Family and Friends and Vermont! Colton is having wonderful new adventures. He got to see six dogs today (all time record for a little boy who loves dogs). And he got to be with Papa Brad – that is a treat for everybody. Papa Brad and a dog, that is like heaven to this little guy. I was so grateful to get to spend time with Julia. Julia and I were high school friends. It has been years and years since we have seen one another. I have always so admired her, and now all the more, now that she has one year old twins. What a gift to see her! 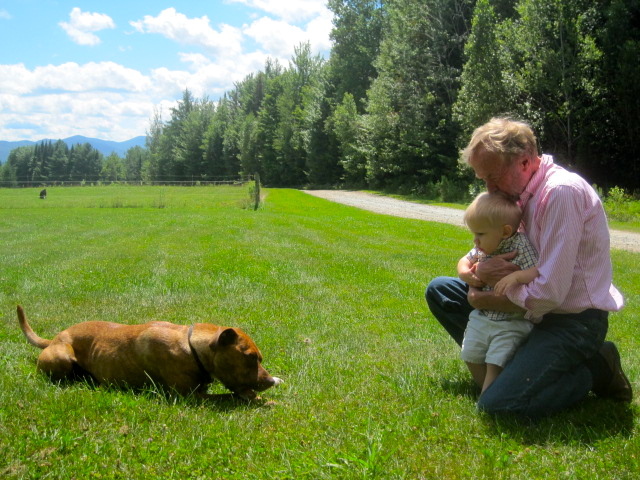 Family and Friends from Vermont in Vermont – yummy summer days. Have a wonderful time visiting family, friends and familiar places! Love your blog and pictures! Thanks for sharing.